Along with all the creepy creation for this Halloween, it’s always a good idea to have some of these bread sticks ready for the kiddies, I mean, after a round of trick or treat or at a Halloween party. 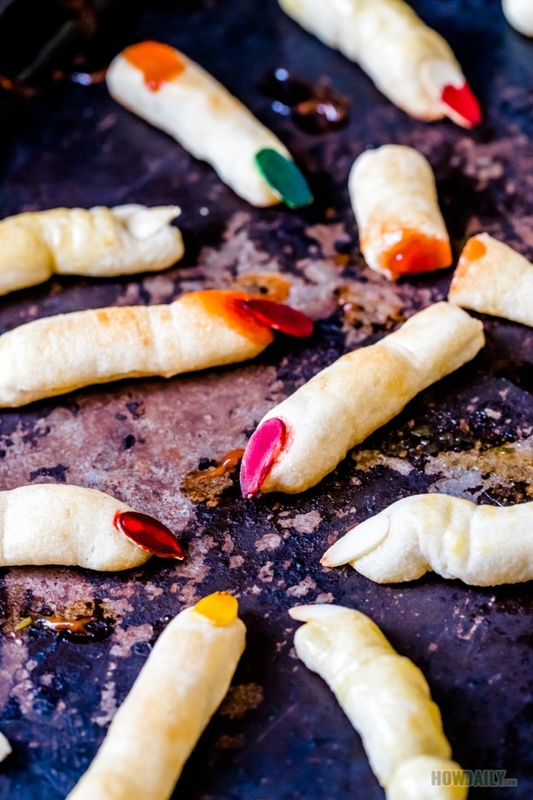 These witches fingers bread sticks will surely set the mood while fulfilling any empty stomach. There’s the option of brushing (or not) the egg wash, which would result in shiny brown bread. Otherwise, just skip it overall. Almond slices would be easiest to do, with recoloring by all mean, but if you have some allergic, try replace them with cracked chips, cheese slices, bell pepper…Just remember to adhere these substitution after baking with some mayo or so. Since bread sticks are best consume fresh, prepare this the same day as your party. You might reheat them once or so in oven, but too many time would cost the freshness quality. Another note is when cutting the roll of dough, irregular shapes will look more fun, so don’t try to be perfect. You can also shape them thinner on both end with some bulky in the mid for knuckle. The bread sticks when done, can be eaten as snacks or sides treat. You can also dip them in soup, like this slow cook pumpkin beef crock pot for heartier flavor. 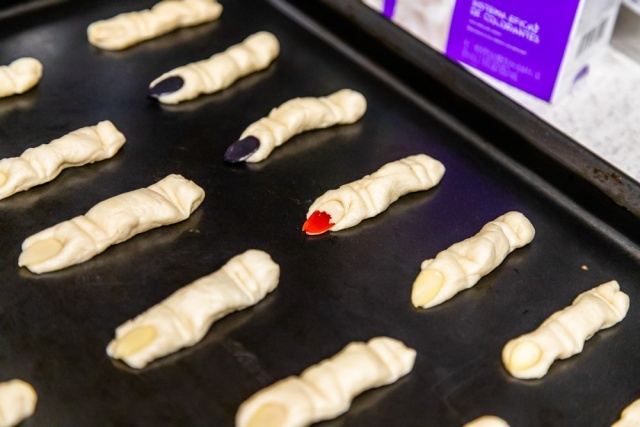 If your Halloween party's calling for something eerie and spooky to fill those ghostling stomach, try this quick and easiest recipe for some creepy fingers. Treat or trick! 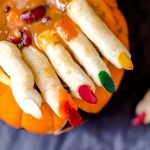 If you want color fingers nails, mix food color with some water. Then brush to color one side of almond slices. Otherwise just use as is. Line a baking tray or use non stick cookie sheet. Preheat oven to 350 F or per package direction. Slice each bread sticks into 4 pieces of about 3 x 0.5 inch. Use your fingers to roll each piece a bit, then taper on one end to make it shape like a finger. Score some marks/lines across each piece with a knife like that of knuckle. Arrange onto baking tray and repeat with other finger bread. Once tray is filled, use your thumb to press down lightly to indent to narrow tapered end, then press a slice of almond on top. Brush them all lightly with egg to add shine. Bake for 10 to 12 minutes. Check back often till they're lightly golden brown. Once done, transfer to wire rack to cool. 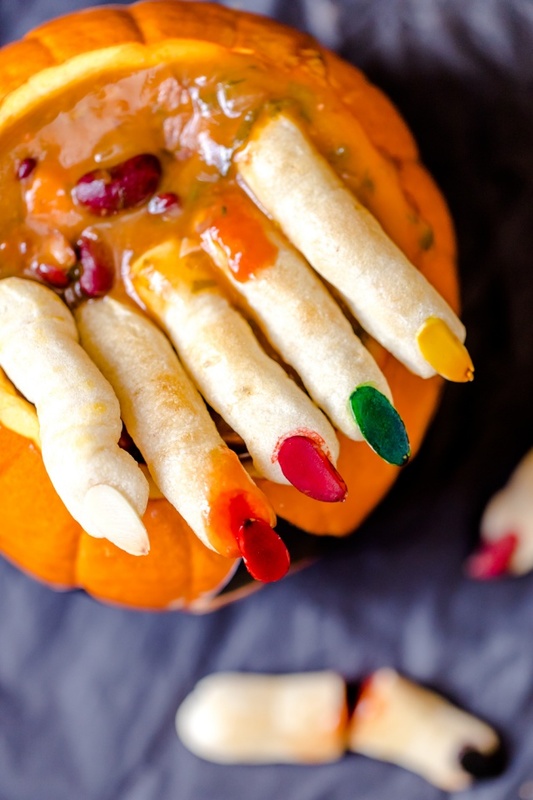 Serve these warm (and a bit crispy) along with pumpkin soup or your favorite Halloween soup. If they're becoming soggy, reheat in oven for 5-7 minutes or so.